It was Logan's 14th birthday on March 12th. I didn't actually forget his b-day, just forgot to post it. I let him skip school the day after , and I took him to lunch at Chipotle. Yummy! I wasn't surprised he finished it, me however couldn't quite polish it off. We then went to the Mills mall to buy him some basketball shoes, which he was very happy with. Later that night he went for a night out with Grandie and Papa. They took him to Chilies for dinner and then shopping for more.............shoes? This time some DC's. They were quite patient with him, I think they said 4 stores till they found the right style and fit. Size 11 1/2 feet these days! I'm glad it was them and not me. I lack patience these days. He then spent the night and stayed up very late watching movies and having a blast! We love you Logan and can't believe how fast you are growing up!! Logan is definitely an out doors kind of guy. He has never been one for playing with toys inside. He loves camping, fishing, Quad riding, shooting guns etc.. 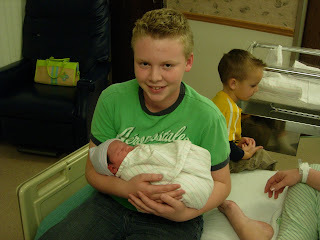 He is a great big brother, especially to Carson, and so far not a terrible teenager. ( he does have his moments) He is learning to be a hard worker, I know he will thank his dad later!! He has some great friends and enjoys a social life!! Happy Birthday Logan! We love you! "...cant believe how fat you are growing up!!"?.... ha, ha! I see what happens when you type to fast! So funny!